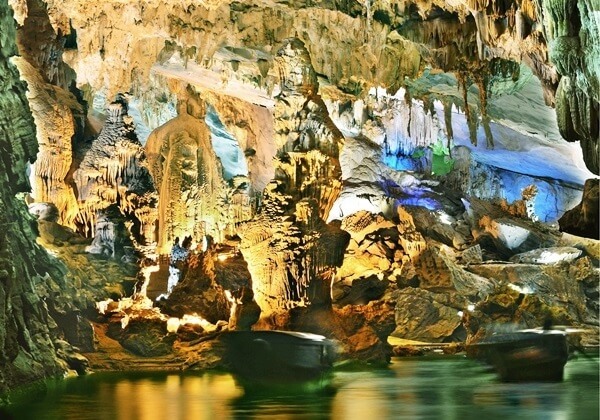 Paradise Cave considered as “underground palace” is one of the most magnificent wonders in Vietnam. 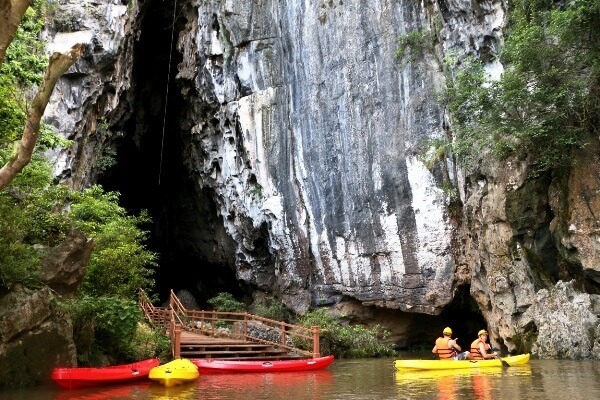 The Cave about 350 to 400 million years old is located deep in the World Natural Heritage National Park Phong Nha Ke Bang of Quang Binh province. From the turnoff in town to Route 20, it’s 13.5 kilometers until the intersection. Turn right onto Ho Chi Minh Highway West, then travel another five kilometers to reach the gate. This newly-discovered cave surrounded by forested karst peaks is the largest complex of caves in the world. The system of interconnected caves was discovered in 2005 by scientists from the British Cave Research Association with the help of a local man. It was recognized as a UNESCO World Heritage site with the whole length is 31 km long, 100m high and 150 wide, making it the longest dry cave in Asia. However, only 900m was opened to visitors and 7000m deep more for adventurers in September 2011; after five years of mining, paving the way, building the up-and-down way. Impressed by the beautiful and spectacular stalactites and stalagmites inside this cave, the British explorers named it Paradise Cave. The interior feels as lofty, heavenly and humbling as a grand cathedral. The entrance fee is about $11 for adults and free for children under 1.1 meters. Another extra is the buggy ride to bypass the long stairs. A four-seater buggy costs $3 one-way and $5 round trip. It will get you within half a kilometer of the entrance, and then it’s a steep walk up paved ramps. After that, it’s time to go down again following stairs that lead into the belly of the cave. The first impression is eye-opening, and it only gets better as you continue down the wooden stairs and along the boardwalk for one kilometer through the tastefully lit cavern. You’ll have a much better experience if you can avoid tour groups, which tend to arrive in the afternoon. Go early and you may have it all to yourself. To experience more of Paradise Cave, the adventurous can go deeper and further 3.5 kilometers with head torches and guides. About 500m first, tube-shaped cave, where more than 80m highest, widest point is about 120met, occasionally we encounter blocks tall stalactite glittering like diamonds. Deeper inside the stalactites and the stalagmites are increasingly diverse and unique, stone breast with a variety of colors and designs, like a hand of the Creator. This magic is in the darkness of caves still exists the life of many species such as fish, bats, spiders, crickets and bats sticking on the ceiling in the first 3.5 km. As far as the bat cave about 200m, there is the junction of two shallow streams that we can enjoy cool breeze blowing from the spring. Then, continue to do Kayak over streams to pass through 100m which is interesting and attractive during the journey. After that, you will have the opportunity to try your courage to overcome the steep road, rugged land along the stream bed, where there are only narrow paths to a threaded through. Without a guide or warning signs makes it easy to get lost in other ways. After enjoying lunch beside the underground stream, you will relax, take photographs and prepare the journey back to the same way. In times of high water levels (usually September to December), the journey will be reduced in length. The cost is $121 per person and $82 for the shorter distance. You can book the tour through Phong Nha Farmstay, Easy Tiger Hostel or Phong Nha Discovery. Paradise Cave is opened daily 06:30-17:00 in summer and 07:00-16:00 in winter. Nature is so close to human, but it always contains a mystery. Are you excited to explore that? Hot Stone Massage In Kota Kinabalu – How Awesome It is!